At long last, the wait is over and fans of the wonderful television adaptation of Winston Graham’s Poldark books finally get the chance to experience the third season in its entirety in glorious high definition. PBS Home Entertainment has just released the Masterpiece production on Blu-Ray and I could not wait to check it out. Seamlessly, the third season picks up where the previous season left off. 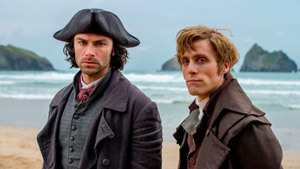 The rift between Ross Poldark (Aidan Turner) and George Warleggan (Jack Farthing) continues to grow and desperate for the adulation of his peers, George not only makes every decision solely based on how it could help him climb the social ladder but also how much it would damage Ross. It is hard for Ross Poldark to keep a level head, but he does so, never taking George’s bait, even yielding to it at times, simply to keep the peace and for the best of the people surrounding him. Even when he is being offered government positions, such as magistrate and Parliamentarian, Ross never feels comfortable with the amount of power that would be foisted upon him. Much to the dismay of his wife Demelza (Eleanor Tomlinson), Ross regularly turns down these offers, well aware that these positions of power would go to George Warleggan instead, who would most certainly abuse them. Fighting the good fight is what Ross lives for and it becomes even more evident when one of his friends is captured by the French. As if the struggles and battles at home were not enough, Ross is determined to rescue his friend and he jumps back into the fray with both feet. Naturally, such a decision opens him up to public criticism by the likes of George who would like nothing more than to see Ross publicly ostracized for his supposed rashness and derring-do. As hunger ravages the people of Cornwall, they become increasingly desperate and the fact that the rich, like George Warleggan, show no signs of empathy, controlling and overcharging for what little food and grain there is, makes matters only worse. 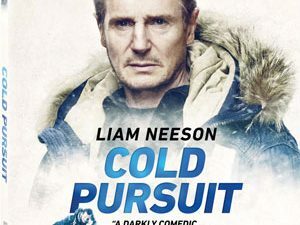 Not surprisingly, outbreaks of violence become increasingly common and despite his best efforts, somehow, Ross keeps finding himself in the midst of everything, torn from different sides and, most importantly, by his own conscience. Since the first season, Poldark has been one of my favorite Masterpiece productions. 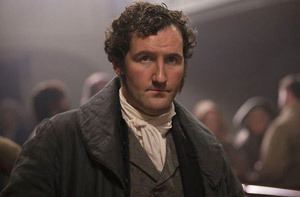 The character of Ross Poldark, who is noble to a fault, contrasted by George Warleggan’s eternal scheming and politicking makes for incredible cinema. Strangely, this season, in particular, is also incredibly poignant, as direct parallels between our own political situation and the one seen in the show can be drawn effortlessly, making the characters and situations all the more relatable. The emotional depth of the show is also a key factor, as characters are never one dimensional. Everyone is battling their emotions and inner demons on a variety of levels and subjects, giving them a depth and color that is not often seen in these kinds of productions. With an incredible cast, the show easily maneuvers even the most tricky emotional of situations. Whether it’s Aidan Turner’s portrayal of Ross’ stubbornness, Demelza’s forgiving nurturing, or George’s despicable antics, every character is perfectly cast to bring life, depth, and caliber to the performance. The storyline keeps twisting constantly. Fragile truces are forged, only to be put in jeopardy by another party for reasons we can absolutely relate to. Unexpected events turn the characters’ world upside down while distinct character traits define exactly which path these figures will go down, only to be diverted when we, perhaps, least expect it. To top it all off, Cornwall’s incredible beauty is one of the show’s most staggering hallmarks. The show is filled with vistas that simply take your breath away, carefully framed to create an often wistfully atmosphere, Cornwall’s rugged wildness is captured and reproduced in the show that it becomes its own character. Presented in a 1080p high definition transfer on this Blu-Ray release, this wild character is masterfully reproduced. With its level of detail, down to every single blade of wind-blown grass, and its natural colors, the show is absolutely magnificent to behold at all times. Deep blacks make sure to keep the image rooted and add solid depth to shadows at all times, without ever losing detail. Highlights are balanced to give the image proper contrast and allowing the cinematography to shine in every frame. A 5.1 audio track also makes sure, the show lives up to expectation and the confident sound mix makes virtually constant use of the surround channels to enhance the experience. From subtle windswept ambiances and the creaking of a sailing ship to the aggressive roars of violent crowd scenes, the show handles each moment with perfection. Dialogues are always balanced and never drowned out, and the superb scoring of the show makes the most of the haunting music. 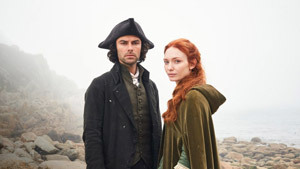 In addition to all nine episodes of the show’s third season, spread over three discs, Poldark: The Complete Third Season also contains a number of promo featurettes. These are really short vignettes, really, that highlight a certain character or aspect of the production. Nothing that really goes in-depth but gives the cast and crew an opportunity to speak out real quick. No one does period drama like the Masterpiece shows, and no one does it like Poldark. One glimpse and you’re hooked. It is hard for me to imagine that it will be another year until this saga will continue but I shall certainly endeavor to remain patient. 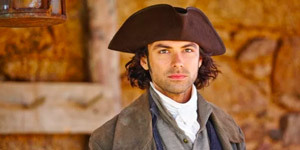 It will be hard because Poldark is television perfection that gets better and deeper with each new season. Get your copy and see for yourself!